NEW YORK (CNNfn) - Market watchers picking through the flotsam left behind by Wall Street's Friday buying tidal wave found that a number of companies had warned of bad news ahead, while a number of biotech stocks also failed to join in the market's euphoria. But first, among the companies that surfed the wave on uplifting corporate news, Web media firm 7thStreet.com (SEVL) soared 1-7/8 to 4-5/8 on reports that the company may be earning an alliance with leading Internet provider America Online (AOL). According to Business Week, 7thStreet may start offering computer classes on AOL soon. American Indemnity (AIFC) accepted a $30 million cash buyout offer from United Fire & Casualty (UFCS), pushing shares up 2-7/8 to 13-7/8. UFC shares, however, did not budge from their 29-1/8 mark. On the losing team, shares of sportswear maker North Face (TNFI) slipped 3-1/2 to 13 after the company withdrew a $17-per-share tender offer as part of its plans to go private. Meanwhile, North Face competitor Rawlings Sporting Goods (RAWL) said both revenue and profits would be rough in the current quarter, driving shares down 1-5/8 to 10. Although the company expects baseball licensing this season to be "exciting," it blamed retailer difficulties and market pressures for expected earnings weakness. Investors also pounded shares of construction firm Michael Baker (BKR) down 3/4 to 7-1/2 for the company's admission of softer profits. Baker said issues relating to a building project at Universal Studios in Orlando, Fla., would cause "material adverse impact" on fiscal 1998 year-end earnings. Casino-equipment maker Anchor Gaming (SLOT) followed market ally International Game Technology (IGT) into the confessional, warning that sliding independent sales would hurt its fiscal third-quarter. Anchor shares fell 5-19/32 to 34-29/32, while IGT, suffering a fresh downgrade to "neutral" from "attractive" from Bear Stearns, extended its losses, down 7/16 at 14-1/4. Circuit maker ADFlex Solutions (AFLX) blamed "particularly disappointing" technological difficulties at two major unnamed customers for 18 percent lower first-quarter sales and an upcoming first-quarter loss. Shareholders also were disappointed, knocking the stock down 11/16 to 3-5/16. Software firm HTE (HTEI) led the Nasdaq in net losses, falling 1-1/4 to 3-9/16 on its own contribution to the pile of warnings. The company said first-quarter earnings will fall short of the mark due to "unanticipated industry-wide slowing in software licensing as organizations increasingly defer software selection decisions to focus on ensuring Year 2000 readiness." Wall Street also was scrupulous in punishing companies that arrived with weak profits in hand. Shares of railroad supplier ABC-Naco (ABCR) fell 1-1/16 to 13-1/2 after the company reported fiscal second-quarter earnings of 5 cents per share, while analysts had forecast a much higher per-share figure of 12 cents. 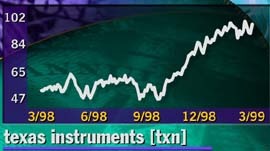 On the bright side of earnings expectations, electronics behemoth Texas Instruments (TXN) climbed ahead of the broader market, leaping 5-11/16, more than 6 percent, to 98-3/16 after reassuring investors that current-quarter revenue is still showing an upturn. In the fiercely competitive medical research field, many smaller firms rose or fell according to the regulatory fortunes of a single drug - or the slightest word from a Wall Street analyst. The FDA seal of approval triggered stock gains for Guidant (GDT), up 7/16 to 60-7/16 on the strength of a new non-coronary stent design aimed at keeping obstructions out of a key blood duct. However, Magainin Pharmaceuticals (MAGN) tumbled 2-1/2 to 1-1/2, losing more than half its value. The company said overnight that its foot ulcer ointment failed to receive government approval. Hambrecht & Quist downrated Magainin to "hold" from "buy" on the news. Ratings were also a negative sign for Biogen (BGEN) and Agouron Pharmaceuticals (AGPH) after Morgan Stanley analyst Doug Lind said "it is time to become less aggressive" on both companies. Biogen fell 2-1/2 to 102-1/2 after Lind cut its rating to "outperform" from "strong buy," but Agouron defied its own downgrade to "neutral" by climbing 3/16 to 57-1/8. Finally, medical information provider Quadramed (QMDC) fell 3-13/16 to 12 on the completion of its merger with privately held Compucare. The company issued $46 million in fresh shares Friday to cover the buyout, about $4.2 million more than previously announced.